With more women coming forward and claiming they have been targeted by serial nuzzler Joe Biden—the hair whiffing, shoulder rubbing scandal is getting serious. People on all sides of his hair-burrowing antics are being forced to pick sides. Is Uncle Joe just a loving older man with a propensity for inhaling the fanciful follicles of women and girls—or is it something more serious and more sinister? Well, that depends on who you ask. It does however beg the question, who did the Vice President smell and when did he smell them? Smarmy is a word that comes to mind suddenly. Some like Julian Castro demand he not seek The White House and claim the former Veeps propensity to waft pomade makes him unfit for office. 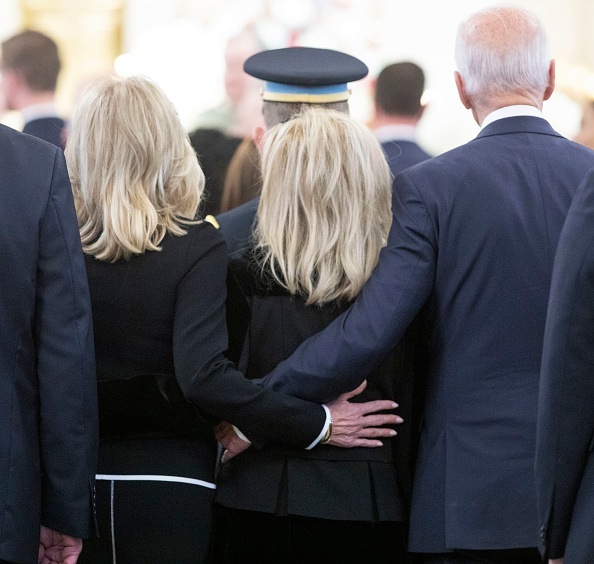 Biden’s odd obsession to nudge, nose, prod and push his way into locks of love—and lean in for a not so casual cuddle certainly puts him in an odd place in the age of #MeToo. Let’s be clear he is not the kind of sleaze bag that is a Harvey Weinstein or Bill Cosby but it is a pattern of behavior that is very unusual to say the least. We usually reserve the nuzzling for dogs and horses but ‘ole Uncle Joe is not going to be denied his moment buried in Head and Shoulders! After all Joe is just a regular guy from a different time who is affectionate according to his defenders who say he’s just a guy who likes to snuggle, cuddle, nestle, curl up, settle down, burrow, embrace, hug or just lean in a bit. Oh, and yeah he loves to rub noses too but that is for special occasions. Its seems ol’ Joe just loves to rub noses!